U.S.-affiliated scientists interested in participating in this expedition can get more information and apply to sail through the U.S. Science Support Program – Apply Now webpage. Non-U.S.-affiliated scientists should apply through their IODP Program Member Offices. Follow the current expedition to learn what it’s like to participate in an IODP cruise, then apply to sail. 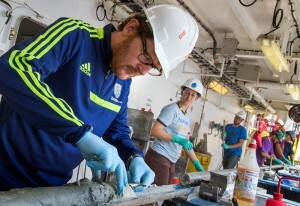 USSSP sponsors participation on IODP expeditions by scientists and engineers (e.g., professors, research scientists, technologists, graduate students) who are affiliated with U.S. institutions (e.g., universities, government agencies, corporations) and who reside in the U.S. at least six months per year. Scientists and engineers affiliated with institutions in other IODP member countries should apply for IODP participation through their country’s national program office. Expedition lengths may vary, but two months is a typical duration. Applicants must be available for the entire length of the expedition. Invitees will be assigned a specific role in the scientific party and must sign an agreement with the expedition operator elaborating their responsibilities during the expedition and their acceptance of all the rights, privileges, and obligations of a member of the science party as defined by IODP policy. Information on the job descriptions and responsibilities of JOIDES Resolution shipboard scientists can be found on the science operator’s website. Salary: USSSP provides salary support to approved U.S. expedition participants for a period of approximately 1.5 times the duration of an expedition in weeks, where the additional time covers preparations, travel, and participation in post-expedition activities. Support funds are for the use of participants only, and cannot be redistributed to a participant’s colleagues or students. U.S. co-chief scientists normally receive a longer period of salary support (up to six months total) due to their additional expedition-related responsibilities. USSSP determines the exact salary period of each participant in light of available funding and other factors. We cannot pay tuition costs for graduate students. Travel: USSSP coordinates and funds the travel of expedition participants to and from the drilling platform and also supports their travel as necessary to pre- and post-expedition meetings for planning, sampling, and coordination of research results. Science party members will receive detailed travel instructions after accepting an invitation to sail. Miscellaneous: In some instances, expedition participants may receive limited reimbursement for miscellaneous costs such as required medical exams, travel visas, and safety training. The overall IODP staffing process is designed to create an integrated science party that will meet the scientific objectives of an expedition while balancing scientist expertise, range of professional experience, and national affiliations as outlined in the program’s international agreements. The process begins approximately 8 to 16 months before an expedition, when the expedition science operator issues a call for applications to sail. Scientists respond by applying to sail through their IODP Program Member Office (PMO). If your affiliation lies with a U.S.-based institution, you apply to sail through the U.S. Science Support Program. The staffing review process within the U.S. has several steps. U.S. applications to sail are reviewed by the staffing subcommittee of the U.S. Advisory Committee for Scientific Ocean Drilling (USAC). Prior to review, the co-chief scientists are consulted to help the staffing subcommittee understand what disciplines are needed to fulfill the expedition objectives. The staffing subcommittee then reviews the applicant pool in that context, while striving to include as broad a component of the U.S. community as possible; this is achieved by recommending scientists across a range of expertise and professional experience. Diversity of gender and institutional affiliation are also considered. After the staffing subcommittee members individually review the applications to sail, a subcommittee review meeting is convened and consensus recommendations are reached in discussions with USSSP, guided by the principles described above. 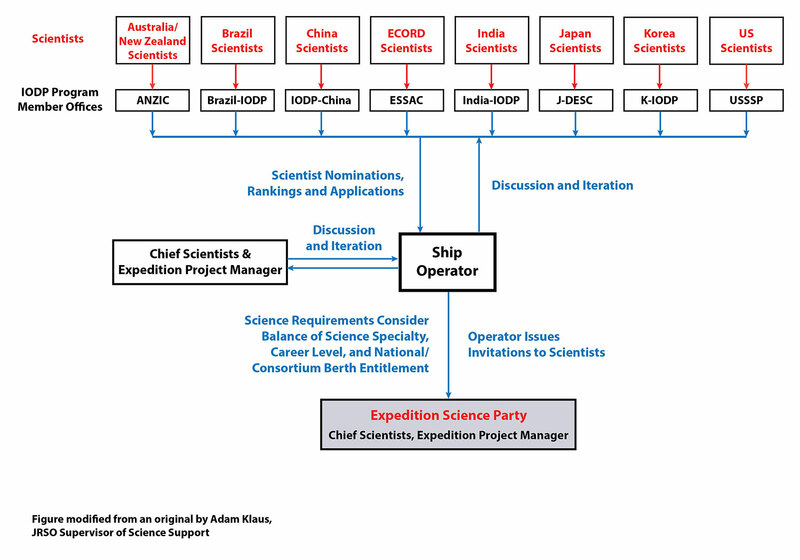 USSSP then reviews these rankings and forwards final staffing nominations, along with the consensus subcommittee rankings, to the expedition’s science operator (JRSO, ESO or CDEX). Finally, the operator then works with the expedition co-chiefs to assess the staffing nominations and rankings of all of the PMOs with the goal of assembling a science party that addresses the expedition’s needs while balancing national/consortia quotas and diversity in career length among all participants. Invitations to sail are ultimately issued by the operator, which informs all applicants of the outcome of their applications.